Joseph-Marie Jacquard was not the inventor of the programmable loom, as many people imagine, actually he created an attachment to the loom, which played a very important role not only in the textile industry, but also in development of other programmable machines, such as computers, for example the Analytical Engine of Charles Babbage. Joseph-Marie Charles (known as Jacquard after the nickname of his family) was born on 7th of July, 1752, in Lyon, France. He was the fifth of nine children of Jean Charles (nicknamed Jacquard) (1724-1772), a master weaver of brocaded fabrics, and his wife, Antoinette Rive, who worked as a pattern reader. From the nine children, only Joseph and his sister Cl茅mence (born 1747) survived to adulthood. Like the sons of many Lyons weavers, Joseph did not go to school, because his father needed him to perform odd jobs in the workshop. He learned to read as a thirteen-year-old boy by his brother-in-law Jean-Marie Barret, a cultured man (a bookseller and printer). Antoinette Rive died in 1762, and after her end the family slid into poverty. When Joseph was of age to learn a trade, his father placed him with a book-binder. An old clerk, who made up the master's accounts, gave him some lessons in mathematics. Joseph very shortly began to display a remarkable turn for mechanics, and some of his contrivances quite astonished the old clerk, who advised his father to put him to some other trade, in which his peculiar abilities might have better scope than in bookbinding. Thus Joseph was accordingly put apprentice to a cutler; but was so badly treated by his master, that he shortly afterwards left his employment, on which he was placed with a type-founder. Surprisingly, when Jean Charles died in 1772, Joseph inherited more assets than anyone expected: his father's apartment, the workshop with two looms, as well as some other real estate (a vineyard and quarry). In 1778, he listed his occupations as master weaver and silk merchant, and apparently at that time he started seeking an improvement in the draw loom. In the same year he married to the rich widow Claudine Boichon. 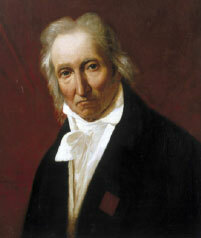 Their only son, Jean-Marie, was born in April, 1779. In the next few years however, Joseph took part in a number of dubious entrepreneurial investments and soon fell deeply into debt and was brought to court, loosing his inheritance and part of his wife's property. So in 1783 he slid again into poverty. Claudine stayed with their son in Lyon, working in a straw-hat factory, while Joseph tried his luck in other places as a lime-burner, a labourer in a plaster quarry, etc., before to return in Lyon in the end of 1780s. Back in Lyon Joseph prosecuted his improvement in the draw loom for the better manufacture of figured fabrics, and he brought out his contrivance for selecting the warp threads, which, when added to the loom, superseded the services of a draw-boy. The adoption of this machine was slow but steady, and in ten years after its introduction, many of them were found at work in Lyon. 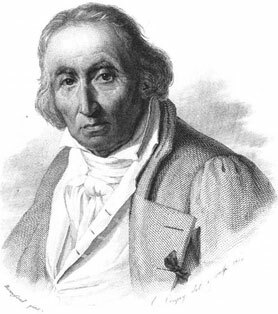 Unfortunately, Jacquard's pursuits were rudely interrupted by the Revolution, and in 1793, he and his son took part in the unsuccessful defense of Lyon against the troops of the Convention, and when the city fell, the two fled together, then adopted false names and joined the Revolutionary army. After seeing some active service in the Army of the Rhine, where Joseph rose to the rank of sergeant, in 1797 Jean-Marie was shot down in a battle, and his father returned to Lyon in 1798, lost again the plot of his life. After a stay in the hospital, he worked at various odd jobs—repairing looms, weaving, bleaching straw hats, driving horse-drawn carts, etc. It was probably in 1799, when he decided to return to the automation of weaving, an occupation, which will made his name unforgettable. In July 1800 Joseph Jacquard applied for his first patent—a treadle loom, then a loom to weave fishing nets in 1803, and starting in 1804, the Jacquard loom, which would weave patterned silk automatically. 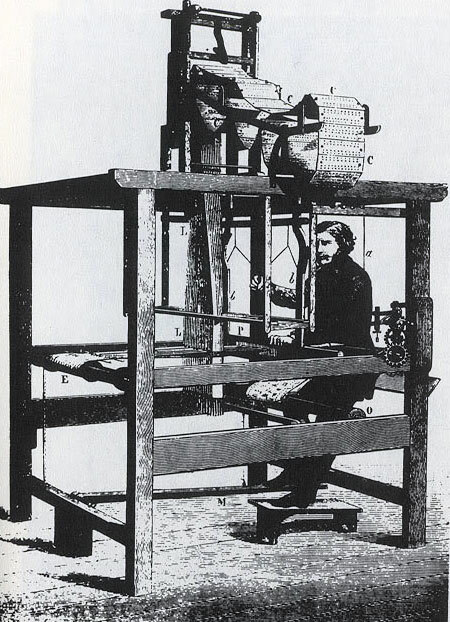 Jacquard took out a patent on his first loom on 23 December 1800. First looms of Jacquard were unsuccessful however, not only because were not operating well, but also for strong opposition by the silk-weavers. When in 1801, after a successful exposition in Paris (he was awarded a bronze medal for the loom by the French government), Jacquard exhibited his first loom in Lyon, the weavers, thinking their bread and butter endangered by the new machine, mobbed the inventor and broke up his invention. Three times the life of Jacquard was threatened by fanatics. Jacquard describes the occurrence himself. "The iron was sold for old iron, the wood for fuel, while I was delivered over to universal ignominy." Luckily, Jacquard's achievement having come to the knowledge of the Prefect of the Department, he was summoned before that functionary, and, on his explanation of the working of the machine, a report on the subject was forwarded to the Emperor Napoleon. The inventor was summoned to Paris with his machine, and brought into the presence of the Emperor, who received him with the consideration due to his genius. The interview lasted two hours, during which Jacquard, placed at his ease by the Emperor's affability, explained to him the improvements which he proposed to make in the looms for weaving figured goods. The result was, that he was provided with apartments in the Conservatoire des Arts et Metiers, where he had the use of the workshop during his stay, and was provided with a suitable allowance for his maintenance. It is out of the question, that Jacquard was informed about the earlier attempts of his fellow-citizens Basile Bouchon, Jean Falcon and Jacques Vaucanson to create an automated loom. While in Paris, he examined the loom of Jacques de Vaucanson in the Conservatoire des Arts et Metiers and suggested various improvements in his own, which he gradually perfected to its final state. One of the first improvements of Jacquard was to eliminate the paper strip from Vaucanson's mechanism and to return to Falcon's chain of punched cards. Then, he tried to avoid the expensive metal cylinders of Vaucanson. In fact, the term Jacquard loom is a misnomer, actually Jacquard's invented an attachment (head), that adapts to a great many type of looms, that allow the weaving machine to create the intricate patterns often seen in Jacquard weaving. Thus any loom that uses the attachment is called a Jacquard loom. Each position in the punched card of the loom corresponds to a hook, which can either be raised or stopped dependant on whether the hole is punched out of the card or the card is solid. The hook raises or lowers the harness, which carries and guides the warp thread so that the weft will either lie above or below it. The sequence of raised and lowered threads is what creates the pattern. Each hook can be connected via the harness to a number of threads, allowing more than one repeat of a pattern. For example, a loom with a 500-hook head might have four threads connected to each hook, resulting in a fabric that is 2000 warp ends wide with four repeats of the weave going across. In April 1805 the Emperor and empress Josephine visited Lyon, and during their tour, they viewed Jacquard's new loom. Jacquard was granted the patent for Jacquard's loom to the city of Lyon. In return, Jacquard received a lifelong pension of 3000 francs, a huge sum for the time. Moreover, he received a royalty of 50 francs for each loom that was bought and used during the period of six years. This was a generous attitude towards the inventor and made him rich. By 1812 there were some 11000 Jacquard looms in use in France and despite energetic French efforts to keep the technology secret, they were also beginning to appear in other countries. 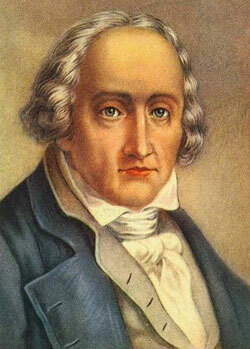 Joseph-Marie Jacquard died at Oullins (Rh么ne), on 7 August, 1834. Jacquard's genius obviously lay not in originating the revolutionary ideas behind his loom, but in building upon the work of previous innovators, bringing their ideas together, adding his own insights, and solving a variety of practical engineering problems, to create an automatic loom that was fast, reliable and most importantly—commercially viable. Jacquard's loom revolutionized the speed at which decorated silk fabrics could be woven. Using the Jacquard loom, a skilled weaver could produce two feet of decorated silk fabric per day, compared with one inch per day that could be produced by a skilled two man draw loom team. The modern Jacquard looms are using image scanners, allowing any visual image to be woven to be inputted into the loom. The scanner, in turn, is linked to a computer, that converts the image into pixels in a program, which is used to control the hooks that lift the correct warp threads to form the image during the weaving process.